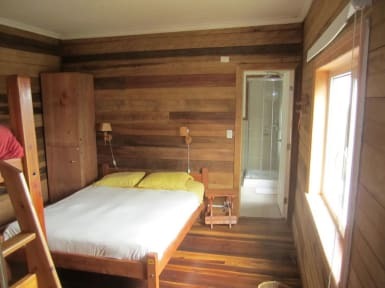 “The Hostel with a mixture of Chilean & Scandinavian flair”, find more than a good Hostel in Puerto Varas! 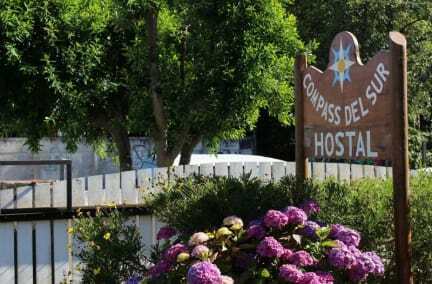 As our name suggests, “Compass´s” mission is orientation with a personal and integrated service, which we have provided our guests -“Travellers” from all over the World – ever since we opened in 1999. Our airy bedrooms (shared & private bathrooms) are furnished with very comfortable beds and warm duvet. A spacious living and dining area with an “internet lounge” gives you a relaxing, cosy and welcoming ambience, 'now and recently implemented with sustentable central heating in all rooms and common areas'. The house has a lovely garden patio, a space for camping and free private parking for our guests. Our guests have free use of our enormous kitchen and its fully equipped facilities. A good filling breakfast with “home made” whole-wheat bread & cake, jam, toast, cheese, traditional southern chilean ham, milk, tea or nescafe is always included in your stay. You can also order our extras like: real coffee, eggs, muesli & porridge with fresh fruit. Our house is well located in an old colonial neighbourhood on a charming street lined with classic German colonial houses, right along side the “Philippi”park, train station and only a 5-10 minutes walk from downtown, the lake and the bus stations. - Free Reservation of external services and activities as' over the lake in Bariloche, rafting, kayaking, etc. A nice and cosy hostel in a nice authentic house. The hostel can arrange bookings so that is very nice. The kitchen is big with enough facilities. Also a big common area and the dorms are quite big as well. The only thing is that some of the staff can't speak English very well, but some of them can. Good option if you're in Puerto Varas.